The ultimate quick-pump garage floor jack. Lifts saddle to chassis in just one easy pump! The ruggedly crafted RFJ-3TQP is a versatile quick-lifter with a 2.7-mtu. lifting capacity. Heavy steel construction and sealed hydraulics guarantee maximum durability, while the built-in safety overload valve protects personnel and equipment. If you accidentally lift a vehicle too heavy for the jack, it won’t suddenly collapse on you and ruin your day. The hydraulics in the floor jack will gently descend. Since you never go under a vehicle that isn’t secured on jack stands, your personal safety and the safety of your property should never be in question, even if you accidentally overload the jack. Plus, with the exclusive "Quick-Pump" feature, this jack rises with only a single pump of the handle. Four pumps and the vehicle rises about 508 mm in the air. It doesn’t get any faster than that! The RFJ-3TQP represents the ultimate in jacking speed and convenience. Imagine how quickly two jacks working in tandem can get you lifted for wheel service, oil changes, suspension work and more! A protective rubber sheath covers the bottom third of the extended-length handle, ensuring even low-profile vehicles aren’t marred when the jack is in motion. Of course, Ranger doesn’t compromise safety for the sake of speed. 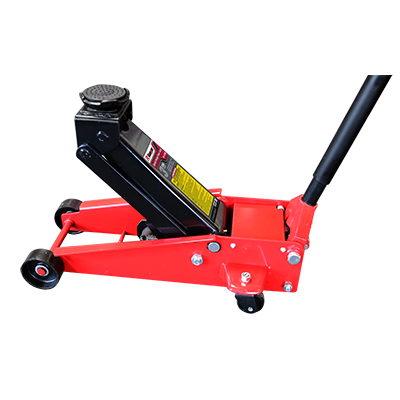 The overload prevention system ensures a gentle, controlled descent in the event of weight overload placed on the jack; it’s virtually impossible for the floor jack to collapse or crash to the ground. The sealed hydraulic system will never leak and is unlikely to require maintenance for as long as you own the jack. Be sure to pick up a set of rugged Ranger jack stands with the purchase of your floor jack. Never operate on a lifted vehicle without the appropriate jack stands in place.